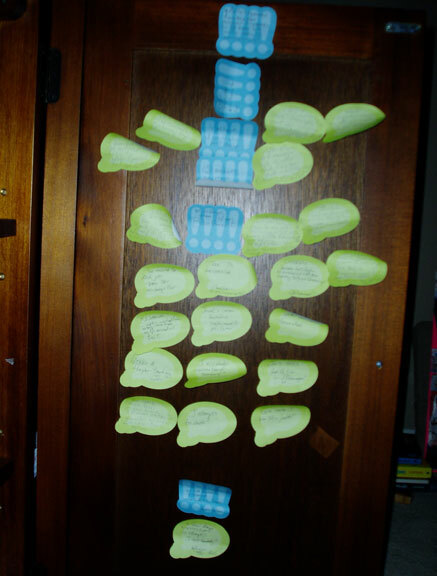 Planning a Novel with Post-Its! As I said in an earlier post, I tend to get images of major scenes, and then I sort of write my way towards them, picking up other ideas and threads as I go. Right now I’m organizing everything through the magic of Post-It notes! They’re just inside a cabinet door in my room. The blue ones are scenes I know for certain will happen–and in what order–while green are scene ideas that haven’t indicated when they’ll occur. Or if. I like this set-up because I can move ’em around, rewrite, or ‘lock in’ scenes whenever. On the downside, they occasionally fall off and get crumpled when I’m getting my pajamas out.